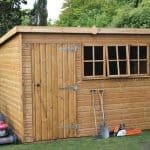 This 7 x 5 windowless tongue and groove shed is the perfect security shed. The lack of windows means that opportunist thieves have less to look at, and will instead be deterred. This makes for a safer and more secure building. The tongue and groove work also provides plenty of stability, and a generally stronger building all round. The building also complies with the sustainable code for homes, which means that property developers can easily fit it into their plans. 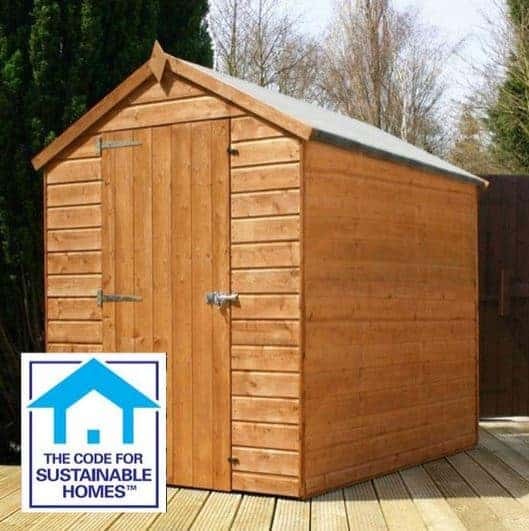 With an FSC certificate and being Sustainable Homes Compliant, this shed is an excellent choice for those concerned with the environment. Not only is it one of the more eco-friendly options available, but it also has a great, traditional design. The quality of the shed is also impressive. 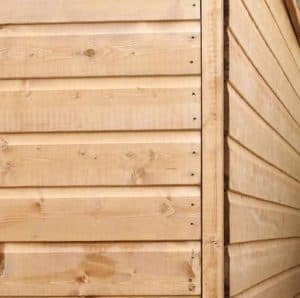 The tongue and groove cladding helps to provide a solid, long lasting shed that will withstand the unpredictable British weather. Shiplap tongue and groove construction – The Shiplap tongue and groove construction provides a high quality finish. 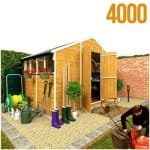 Giving the shed a tough, solid structure, it is guaranteed to last for many years. The tongue and groove aspect of the build leaves an expansion gap that allows for any warping due to change in temperature and moisture throughout the year. The Shiplap design has a groove that runs parallel with the timber to also protect against rainwater. Windowless security – The shed comes without windows in order to ensure ultimate security. Your belongings will be safely hidden from view of potential thieves. FSC certified – Like others in the range, this shed has been FSC certified, meaning all wood used for construction is taken from sustainable forests only. 10 year anti-rot warranty – You are covered with a 10 year anti-rot warranty for peace of mind. 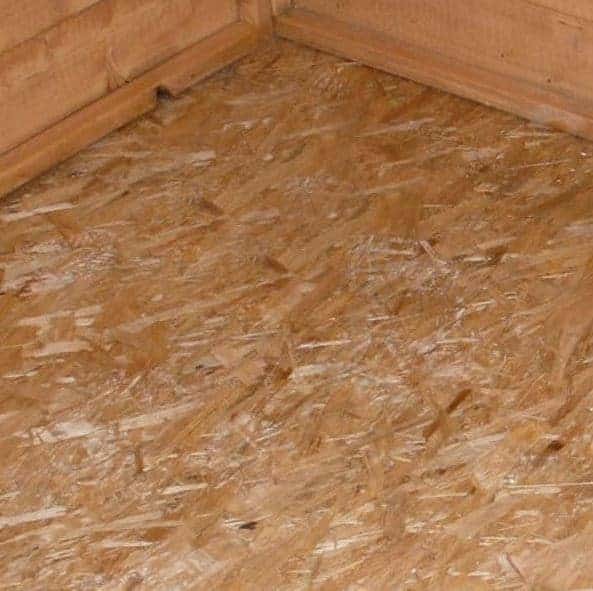 Solid sheet materials – The shed comes with solid sheet materials for both the roof and the floor. This helps to provide a sturdier overall base. Complies with the Sustainable Code for Homes – This shed has been built in accordance to the Sustainable Code for homes. This is especially beneficial for property developers. Single door – The single door opens up wide to provide plenty of space to move items in and out of the shed. Sand felt roof – The shed comes with heavy duty sand felt to further enhance its weatherproof features. Please note – All measurements are provided in feet and inches. Thanks to the Shiplap tongue and groove cladding, this shed is extremely strong and capable of storing heavy items. This means you won’t have to worry about it crumbling under pressure. It also comes without windows so whatever you choose to store will be completely private, adding to security. It poses no risk of splinters and has a smooth, high quality finish making it safe even for young children to touch. 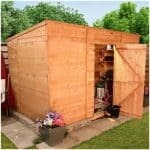 Out of all of the sheds we have reviewed, this has proven to be one of the easiest to install. 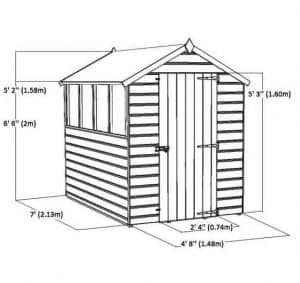 It comes with everything you need to assemble the shed and the instructions are very simple and easy to understand. The only thing that you do need to keep in mind is that it will take at least a few hours to assemble. It is also a two person job. How could we not start with the quality this shed provides? You can tell just by looking at the shed that it has a solid foundation. It is effortlessly attractive and has been built to withstand harsh weather conditions. The Shiplap tongue and groove cladding has small channels that filter any water away from the timber; making it the most weatherproof type of cladding available. So if you live in a particularly rainy part of the UK this is definitely a good shed to choose. Being both FSC certified and Sustainable Homes Code Complaint, the shed is also great for those worried about the environment. It may have been constructed especially for property developers, but homeowners can also benefit from this eco-friendly design; particularly if they decide to sell their home. So what are the cons? 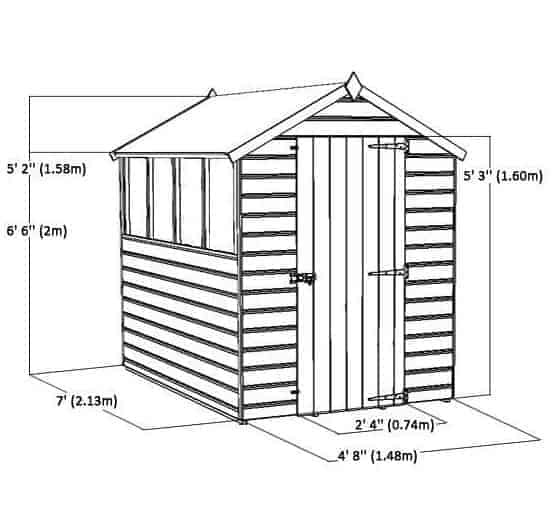 Well the shed does come at a slightly higher cost due to the Shiplap tongue and groove cladding design. This may be a negative thing in the short term, but actually it provides excellent value for money in the longer term. If you use a spirit based treatment, the shed will be protected against all weathers for a long time. What’s more, you don’t need to reapply a spirit based treatment every year so you’re saving further money there. The windows could also be a potential downside. 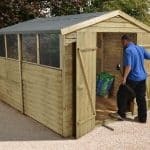 If your garden is fairly open, there is a chance that people walking by could see what you are storing. This increases temptation for thieves. 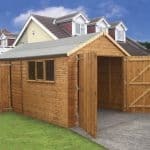 Of course, you can invest in additional security as well as cover up valuables inside the shed. The Shiplap cladding also makes the shed a lot more difficult to break into. 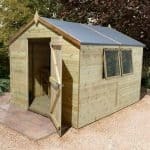 Easy to assemble and extremely safe and durable, this 7×5 Shiplap tongue and groove shed is a superb choice for any home. Built to really last, the shed is weatherproof, offers a strong structure and is one of the most secure sheds on the market.